I know the King Air will get me in and out of anywhere, in any weather, and it will carry almost any payload in a 500nm radius. It’s an easy decision, the King Air is a go. The Beechcraft King Air is iconic in the pressurized twin turboprop world. Most charter departments have one because they are reliable, couch comfortable for the passengers, and have a spectacular safety record. To know King Airs is to know that there are so many variations of each model that it makes salesmen pull their hair out. Pilots know that you can jump into any model variation of the Beechcraft King Air and recognize instantly they are definitely from the same family, but like all children, each model has its own distinct personality and talent. What the entire family shares is the recognition of a trustworthy and reliable airplane that can perform under the most intense conditions. They sit high on the ground and visibility for both pilots and passengers let you feel like you have your own wings. 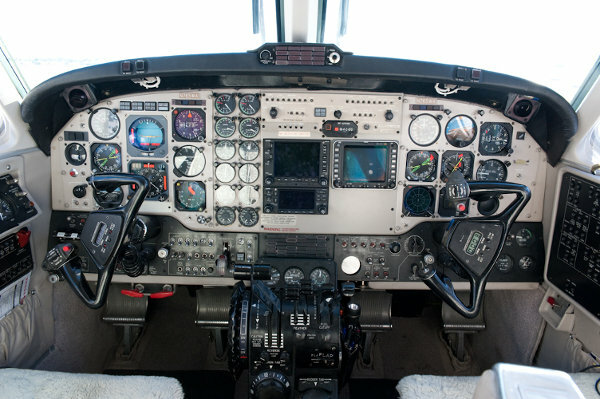 Beech has produced six different basic King Air models over the last fifty years. The oldest children, the Model 90 and Model 100 series are known as King Airs, while the newer and faster siblings, Models 200 and 300 series, were originally marketed as Super King Airs. The “Super” was later dropped, but the moniker is still used to differentiate the family members. The charter and air ambulance company I flew for early in my piloting career had four 90s, two 100s, a 250 and they used me for pilot services in a 350, so I got to meet the family (but not all the aunts and uncles). So, let me introduce them to you. The first Model 90 series was conceived in 1961 and born in 1964. It has been tweaked through twenty-plus variations in fifty years with the most recent version in the C90GTx which is certified up to 30,000 feet. The 90 has evolved to have composite winglets, swept-blade propellers and can carry eight passengers at 272 KTAS. I got to fly several models of the 90, but my favorite was the C90B. It has a four-bladed propeller and propeller synchrophasing which was an attempt by Beechcraft to reduce cabin noise. The synchrophasing was a nice idea, but the airplane and I had a different idea of being in synch. You can move the hum of the engines forward and aft depending on how you manually synch it, but when you used auto-sync, it dropped the noise into the pilot’s lap. If the passengers were behaving, I’d move the noise away from them. Standard configuration can hold five to six, cruises at 226 knots (260 mph), but with a stall speed of 78 knots, this model is about getting you in and out of tight spots with ease, not necessarily setting any speed records. The King Air 90 could be reconfigured into air ambulance mode, so the flight department had options, but not wanting to always have to take two mechanics away from other jobs to constantly reconfigure, our flight department decided to dedicate two King Air 90s to the air ambulance configuration. Model 100 series’ motto was more room, more power, and more payload. 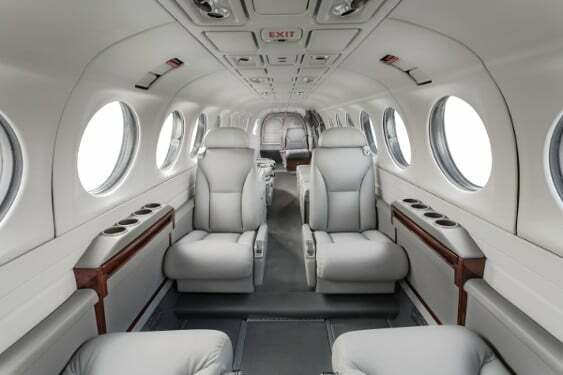 For the king air 100, they stretched the cabin and fit five passenger windows on each side instead of the original three. Raisbeck Engineering came along and offered a number of performance-enhancing modifications including dual aft-body strakes, high flotation landing gear door and nacelle wing lockers. There are modifications for the entire King Air series which increases climb and cruise performance while reducing noise and drag and increasing cargo space. With the increased rudder height and area compared to the 90, it allows this bigger and heavier aircraft to maintain a low minimum control speed. One of the quirks of the king air 100 series is that during production, Pratt & Whitney workers went on strike and halted delivery of the standard PT6A engines, so Beechcraft installed Garrett TPE331 engines on the King Air B100. There was consistent feedback that this was not the preferred engine, so Beechcraft went back to using Pratt for later models. You can discover more about Raisbeck Performance Systems and EPIC Packages—and which systems are OEM—on their website. The Model 200 has essentially the same fuselage with three feet more than the 100, but the striking difference is the T-tail design. The T-tail moves the tail away from engine exhaust and helps reduce aerodynamic interference. Built during a time when fuel consumption was becoming more important, being able to carry nine people on a 500-nm flight while burning 156 gallons of JetA equates to 33 passenger miles per gallon. Corporate jets can’t compete with that level of fuel economy. To sum up its ability, simply remember it can fly in and out of 3,000 foot runways, climb to 35,000 feet cruise altitude and true out at 300+knots. 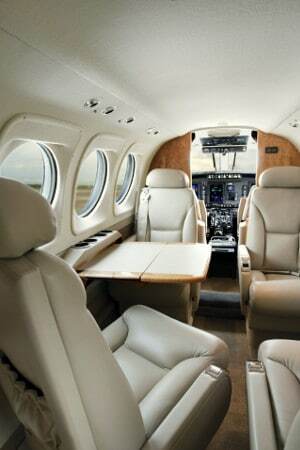 The King Air 200 series proved so popular that Beechcraft took its existing 200 design and just added on to the idea. The King Air 300 has even more powerful engines (PT6A-60A, rated at 1050 shp), has redesigned pitot cowlings and MTOW increased to 14,000 lbs with a 300-knot cruise speed. Since FAA Part 23 category says you need a type rating for aircraft over 12,500 lbs, the 300 and 350 are the only King Airs that require a type rating. The King Air 350 is certified up to FL350 which also makes it a rare turbo-prop flying in jet airspace. All the King Airs have relatively high landing gear and flap speeds, but the 300 model can fit in with the jets at altitude, but slow down and get in line with slower, single engine aircraft in the traffic pattern. With over 7,200 Beechcraft King Air produced and still in production today and 60 million flight hours all over the world, pilots know that the King Air still reigns. Merci egalement d’avoir cree ce site et de disseminer de telles informations. Nous partageons ensemble, au dela des kilometres qui nous separent, la meme passion de l’aviation et de tout ce qui la compose. La seule difference est que moi j’ai envie d’apprendre a piloter, et d’avoir une palette d’avions pour creer une compagnie locale multi-services (transport, medevac,..), alors que je suis sans sous et sans relation philantrope. Mais encore merci pour ces informations. Je les suis regulierement par le biais de la newsletter. Bon courage! Great article. Had to read it twice!